MedPro, Inc. - We buy and sell medical lasers. All lasers completely inspected and PM'ed. We refurbish and recondition our lasers! MedPro is a rapidly growing company with industry experienced management and staff. We are dedicated to providing our customers with quality service, parts, and new or refurbished lasers at competitive prices. Our experience and responsible service has gained our customers loyalty and confidence. We pledge to conduct our business with the highest level of integrity and fairness. Please take a minute to read what our satisfied customers are saying about MedPro. By far you are the BEST laser company I have ever worked with in the industry! I am sure I will be buying more lasers and technology from you again in the future. Thank you again!! I wanted to express my thanks to MedPro for exceeding my expectations during our recent purchase of a Lumenis Lightsheer laser for hair removal. Mike was so helpful in the process of buying the best laser at the best value for our medical spa. I would definitely recommend MedPro as the way to go when buying a laser. Thanks again for the excellent service! This note is long overdue and we apologize for it taking so long to say THANK YOU. During our decision making process to buy the Lumenis Lightsheer, you were by far the best person we dealt with. Others would say things that made us feel like we were bothering them or we could hear the impatience in their voices. You, on the other hand, were very patient to explain things once or twice as needed and never did we feel pressured to buy. You were prompt in getting back to us and I do not recall you ever trying to talking us out of doing more research on the net. We felt you negotiated fairly with us conceding some points and explaining why you could not on others. We felt you were trustworthy and someone we could purchase from with a clear conscious. Two other people we were speaking to did not make us feel this way. The timing and delivery went smoothly and you were generous with your time even after the sale. My business is a small business and I don't expect to purchase another machine any time soon. If I were or if I had the opportunity to recommend a dealer to someone, I would not hesitate to recommend you and MedPro! Thank you again. We LOVE the machine you sold us and can't wait to use it more and more! I will surely be in touch with you again in the future to purchase additional equipment. It has been a pleasure doing business with you. I truly appreciate your follow up and advice. Just wanted to write and say thank you for the smooth transaction on the Lumenis M-22. It arrived in nine days, was superbly packed, and is in pristine condition after it traveled half way around the world! I will be happy to deal with you guys again. I have been working with Mike Moreno and MedPro since 2007. Mike has helped my Toronto based business grow and thrive. Mike has a keen sense of where to fill in the blanks with equipment in order to be super competitive in todays Med spa business. I have trusted Mike with great sums of money prior to receiving equipment and he does what he says he will do and when he says he will do it. Mike and MedPro believe in excellent client care and having clients for the lifetime of their business. Mike is the first call I make prior to making any equipment based decisions. I want to thank you for your great customer service and attention to the purchase of my laser system. I am extremely happy and satisfied with the sale and impressed with Mike's knowledge and guidance when purchasing a used system. The system was delivered on time, securely, and professionally packaged. It works to all specs as promised. I would highly recommend you and your company MedPro to anyone wanting to purchase a used medical device or laser. Great customer service, honest, responsive, and knowledgable. I will be purchasing again for sure. Just wanted to tell you how happy I am with my Accent XL. You did a stand up job. You maintained a professional attitude as well as compassion for my stress. The machine was everything you assured me it would be and it looked new! YOU ARE AWESOME MEDPRO!!! Thank you for a job well done. I hope to do business with you again in the near future and will refer others to you without hesitation. We started using our Cutera Xeo that we recently purchased from Mike Moreno at MedPro, Inc. It is working great! All patients are extremely satisfied and Traci did an excellent job with the training. I was referred to Mike at MedPro through another Doctor and I couldn't be happier! Dr Keith P. Radbill, D.O. I was more than satisfied with my purchase from Mike Moreno and MedPro. He and his staff went above and beyond to ensure that I was happy with my final sale and delivery of the laser. I would gladly recommend him to any of my colleagues. Excellent job. Everything in place just as it should be. Very pleased with this purchase. Thanks. Hey Mike I just want to say that this has been the most painless purchase that I have made. You have followed through with everything that you promised. I have really enjoyed doing business with you. I would highly recommend you to anyone who wants to purchase a laser. There just aren't that many people who follow up like you did. There is a lot to be said for someone who conducts business the way you do. I wanted to thank you for being able to make a purchase with peace of mind. Thank you. I purchased a Alma Soprano XL from Mike Moreno at MedPro, Inc. 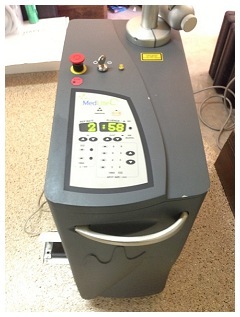 The machine is in excellent working order and in use at my laser clinic in London. I am happy to provide a reference to any prospective purchaser as I have always found Mike to be very helpful. He even sourced a part for me through his contacts for a laser I did not even purchase from him. My business is in Vervena, london and you can feel free to contact me directly at +0042076244444. I must say you are a man of your word. Everything you promised, you delivered. I am even more grateful to you as you allowed me the opportunity to purchase something more superior then I originally planned on attaining. Thank you Mike and MedPro for all of your help and support. I looked in to a few other companies offering pre-owned lasers. MedPro was very helpful in explaining the differences between the wide array of systems and offerings. I was then able to make the right choice for our needs and budget. I got a Syneron Aurora machine from them. They were very trustworthy! Machine is awesome and at a great price! Packed with professional thick plastics so it was really safe. I would like to do business with them again! They are A++++++++. Mike- Just wanted to let you know the machine is in absolutely perfect condition. Far exceeded my expectations. Great price, great service. I have purchased four different machines in the past year from other vendors and this was by far the easiest and best transaction. I will be using you for all my future purchases. Thanks. Fellow Physicians, I have had the opportunity to purchase a good deal of new and pre-owned lasers for my Vein Center and Medical Spa. Mike Moreno has provided me with superior service over all other salesmen I have worked with including new purchases. His commitment to me as a customer, both before and after the sale, has far surpassed my expectations. I would highly recommend him as a diligent and outstanding salesperson and I hope to have the opportunity to work with him again. To Mike at MedPro: Thank you so much!! We love the machine! We will contact you for future business. To Mike Moreno- I would like to thank you for the outstanding service you provided all along the purchasing process. I have a Lightsheer XC 400ms in excellent condition at a very good price. The technical specifications regarding head room values you sent me prior were checked by my technician and they were exactly the values you had told me. In addition, my technician mentioned that the system you delivered me was in excellent condition. The Lightsheer XC 400 is currently being used daily in my practice. My medical assistants love it! By the end of the year, I will be needing another Lightsheer. I will without any doubt contact you for this device. Thanks again! To Mike Moreno and MedPro, Inc. Many thanks. We cannot be more pleased with your receptiveness, integrity and honesty in our dealings. Not only did you provide us with the desired laser, you have remained stalwart and solid during all conversations and communications. This is in sharp contrast to our previous experience, which left much to be desired. We truly appreciate your positive approach, backed up by real product and follow up. You may just have salvaged our new laser tattoo removal endeavor. Again, much bravado is in order. To Mike Moreno and everyone at MedPro: Everything has been received and it all looks great! Thank you very much. It was a pleasure working with you! Last month I negotiated for equipment with Mike via e-mail. I went to the US to pick it up in person and I am really satisfied with the machine. Mike and Chris were very honest and clear during the negotiation which was very simple. I sent lots of e-mails and they always answered me back promptly. The machine was exactly as they had told me. Also during my trip they kept in touch with me to make sure everything was alright up to the moment I was home. Thanks a lot guys! The laser is working well. One of the lenses was cracked but there was a spare included so the problem was easily rectified. All in all I am very satisfied and would be happy to purchase another laser from your company. Our Medical Spa located in Lithuania purchased a Velasmooth from MedPro. We received a great machine in like new condition. When we needed to replace the large head on the system, there was no problem and Mike took care of everything. We got a great machine at a great price. Our experience with Mike Moreno was nothing short of fabulous!!! 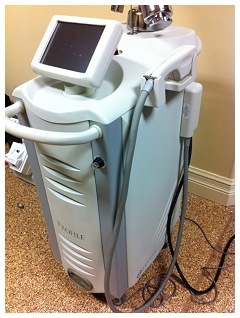 We had toyed with the idea of buying an IPL laser for my new business as opposed to renting one. We had rented a laser prior to buying and found it to be too much hassle with working out the scheduling, etc. I then contacted Mike to see if laser seen on his website was available. It was and the process began to purchase this machine (ELOS by Syneron). Within 2-3 weeks we had delivery of our unit to our business...with each head included, base unit in superb condition, glasses included and instruction material included for each treatment. The delivery was on the date it was promised (actually, 1 day early!!!). When the driver realized he would be 1-2 hrs later than first discussed, he immediately contacted us and kept us apprised of where he was...amazing service! The driver stayed as we tested the unit and each head and when this was accomplished, he then took our payment. I, honestly, have seldom come across service where they actually do what they promise and this was a great surprise. We will absolutely do business with Mike and his company again. My experience with Mike Moreno and the team rates 5 stars. They were very professional and responsive to my particular requirements. They called or emailed me back promptly with answers to my many questions. My Apogee Elite was delivered by a wonderful man who was very knowledgeable, courteous and patient during a delay caused by my own electrician. The laser is everything that was promised (confirmed by my personal Cynosure repair man) and I couldnt be happier. I highly recommend Mike for your next laser purchase. Feel free to contact me by phone or email for a reference. We would like to say that the VelaSmooth you sold us two months ago is really working well. We would like to say we really appreciated your professionalism. Everything went perfectly. Thank you. My experience with Mike Moreno and MedPro was oustanding. Mike was honest, straight forward and easy to deal with. He is clearly committed to providing a quality item to deliver outstanding results to patients. Mike is very knowledgable about lasers and helped steer me to the right machine. The laser was professionally packaged and he even came himself to ensure everything was working. Overall, an outstanding experience at an outstanding price. I will be using MedPro again and highly recomend them. Laser is already at my place. Everything is allright. I am very pleased. Thank you. Mike, I wanted to drop you a note regarding our experience. Being new to the healthcare industry and with an unfamiliarity to the parties involved, purchasing a laser technology was at first a daunting task. You quickly eased our concerns. You took the time out to come and meet with us to understand our business needs and executed on exactly what we were looking for with regards to a laser. Although we had a few bumps with the equipment delivery, you kept to your word and offered us our money back and an equal product as well as compensated us for our lost time via a discount. You also offered us marketing support and guidance. We are confident that we are working with top notch people at a top notch firm. Please don't hesitate to use me as a reference and extend our thanks to your team. All in all, we are pleased with our experience and everyone who works there. The training went well as Traci is very good at what she does and is extremely knowledgable. You can feel free to use me as a reference should you desire. With regards to my transaction experience, I found it to be business like and professional as it needs to be. The communication and availability was good. I will be a repeat customer. Colorado Health and Youth Inc. It has been a pleasure buying from you. Your communication is superb and the delivery was prompt and without any hassle. I also appreciate the sales support you have given me after the sale. Just wanted to let you know we got the Lightsheer and it is working awesome! We really like it a lot. Thanks for everything. My wife and employees worked with both Starlux units and handpieces and they were perfect. (Quality + price). We are very satisfied. Thank you for everything. Thank you for the great transaction. The company did a wonderful job and I am totally satisfied. I just wanted to thank you for such a smooth transaction, timely delivery, and your great customer service. The laser is in perfect working order. The delivery was excellent and the packaging was superb. Mike, I just wanted to drop you a note to let you know what I thought of you and the process of obtaining the laser and cooling unit. Quite frankly, dealing with you was one of the better experiences I have had with a device purchase. You returned my many phone calls in a timely manner and answered my many many questions. Last but not least, you sold me a unit that had just what we needed. Not to mention you saved us over $100,000 in buying used as compared to new. Although it would have been easy for you to sell us more than we needed, you were honest and provided us with what was most practical for our clinic. It is so rare now a days to deal with someone who does what they say and does it the first time! You are straight forward and I look forward to buying more equipment from you in the future. I also believe you messed up and sent us NEW units as these certainly do not looks like they have ever been used. Thanks Mike for all your help as without you this business would have never gotten off the ground. Thank you- We have just received everything and all is in great condition. Once again, it is a great pleasure doing business with you. Dear Mike, Charlotte, and the rest of the MedPro crew who made it happen: Words cannot describe how happy and elated I am regarding my purchase of a VelaShape from you. You are true to your word. Your quick actions to remedy my issues stresses my faith and trust in you. Please accept my extreme thanks for your great service and commitment in making us happy customers. I will continue to support and refer to your organization because I am a believer! I just wanted to drop you a line to let you know how much I appreciate all you went through to get me the machine I wanted. Not only were all my specifications met, but you did it in record time!. You had everything ready for me the day after it was requested. It was in great condition and you ordered the extra parts I needed so I was ready to work the next day without any obstacles. We look forward to doing business with you in the future. I have already recommended MedPro to others! Thnks for all your help. We received the laser last week. It is in BEAUTIFUL condition. We were all quite shocked after our previous experience with a different pre-owned laser company. We have already done three procedures and everything is working just fine. Again, thank you! As a new Med Spa, we are still figuring out what works and what doesn't. I felt very comfortable working with Charlotte because she knew her products. Everything from the equipment to the consent forms for patients were provided. I would definitely recommend this company and Charlotte to anyone. Thank you for your great service! From the search process through the delivery of the laser, MedPro is very professional. The customer service I received far surpasses any other laser company. I will definitely use their services again in the future. Just wanted to tell you how impressed I was with the training and equipment purchased from MedPro. Traci is so easy to work with and made me feel comfortable understanding the ins and outs of the laser. I found it informative and exciting. It is reassuring to know I can call her anytime for more information as needed. Thanks to Mike, Charlotte, and everyone at MedPro for making it easy for me. I purchased a Lumenis Lightsheer from MedPro and worked with Karen Hawk on the transaction. Even located in Pakistan, the service I received from MedPro both during and after the warranty period has been excellent. I look forward to working with MedPro again in the future. I would like to thank you for all the services you provided me with thus far. All the equipment came looking brand new. Thank you for your patience with my endless questions by e-mails and phone. You have been very attentive to all my needs and problems in my new small business start up. I look forward to continue working with you. I have a busy hair removal and skin rejuvenation business. When I looked in to buying another system, I decided to save money and go with a used unit. Not only did I get a system that fits my needs, but I have a great company like MedPro backing it up. Salem Laser and Skin Rejuvenation Center, Inc.
Jennifer, Thank you for being so patient with me through this whole process. You answered all my questions andcalmed my nerves down whenever I had any questions or was anxious about something. You did a great job. Thanks again for helping me start up my small business. It was a pleasure working with you. I want to thank you for the great service you have given Jean and I on the purchase of our Lightsheer and Quantum. We appreciate it very much! I would reccommend you highly to anyone. Our purchase from MedPro was by far the best experience we have had with an equipment company. The delivery, training, and follow up was provided as scheduled and on time. Our equipment has been reliable and provides great results. I would like to thank you for your superb and outstanding service regarding the acquisition of my Lumenis Lightsheer XC. Your attentiveness exceeds that of any company I have dealt with or was contemplating dealing with when I made my purchase. I appreciate your quick replies to my e-mails, questions, and concerns. Delivery of the laser was just as professional. I look forward to doing business with MedPro again and will continue to refer you to everyone. Thank you so much!! The E Laser was delivered at our address in The Netherlands. The system looks new and is in good working order. Everything went perfect and MedPro absolutely earned our future business. When we are in the market for a system of any kind, we will contact you again. Chris, We are thrilled with the way everything has turned out. We are totally happy with MedPro's performance. You have earned a customer for life. As a founding member of TACLER (Texas Association of Cosmetic Laser Education and Regulation), I will personally tell all our members of our positive MedPro experience. MedPro has been an absolute pleasure to work with from start to finish. They have a wide variety of excellent products. Their customer service is also outstanding including their prompt and courteous attention AFTER the sale, which is rare in this business. MedPro is superb about educating you to find the appropriate laser for your practice. Thank you Jennifer Hamick for your patience and dedication. The best thing about MedPro is that they really know lasers! The physics and understanding of the technology they provided helped me choose the correct laser for my business. The attitude and continuous availability by phone or e-mail as well as the willingness to help in all areas ensures that I will be a repeat customer! I can say I have had only the best of customer service with MedPro. I would gladly buy from you again and recommend MedPro to anyone looking for a laser. From the first step of looking in to which laser to purchase down to financing, the customer service has been nothing short of the best. Look for me to purchase from MedPro again! Chris, I am impressed not only with the laser I bought, which is like new, but also with the high professionalism and honesty of your company. Thanks. I would like to thank Chris for all his help with my purchase of the Luxar Silloutte Endermologie system. You were very helpful and ready to answer all of my questions. The shipping of the unit was very professional. Again, thank you for your help and follow up. Buying our Lightsheer from MedPro has been a positive experience from the get go. Not pushy, but very helpful. They promptly returned phone calls and e-mails and educated me in the process. They have been tremendously responsive and have gone above and beyond in providing exceptional service. We WILL buy from them again. A thanks to Jennifer Hamick for all her help in selling us our new laser. You were very helpful in laying out the options for us. The process was efficient and I appreciated you keeping us informed every step of the way. The end result was as good as we could have hoped for. From the initial contact I made with MedPro, to educating me about my options, and then delivering my equipment and training my staff and me, MedPro exceeded my expectations. Mike and his staff went out of their way to address every concern along the way, including problem solving and trouble-shooting before I even paid for my equipment. I bought three lasers from MedPro and hope to acquire another soon. I wouldn't consider using another source without first contacting Mike Moreno. There is no substitute for great customer service! Thanks for making a potentially stressful major purchase a breeze. I once again wanted to thank you for your help in acquiring the Sharplan 40C laser. As you know, I've been looking for a resurfacing laser that is portable and delivers adaquate energy. The 40C fits the bill. The machine you got us looks to be in great shape, and the tech that set it up did a great job. I also wanted to specifically thank Jake for his help in getting us the manual and treatment settings to get the machine up and running. I appreciate the effort he put into making sure we were happy. I would like to recommend MedPro to anyone looking to purchase used hair removal equipment. Mike Moreno was very easy to work with and everything he told us was correct. There was very good communication before, during, and after the purchase. I purchased a Lumenis Lightsheer EC and it was shipped to my office and is in excellent condition. I have not had any problems or concerns with the equipment and it was just as described. I would like to thank Mike Moreno and his staff for providing me with excellent service and support. I purchased two lasers from them and they were able to deliver them as promised. When unexpected circumstances arose, they stood behind their promises. I am looking forward to doing more business with them in the future! I would like to send a huge thank you to Mike Moreno and MedPro for all you have done for our business over the last year. Finding MedPro has saved us tens of thousands of dollars on equipment as well as repairs. When we first met Mike, we had two clinics. Now we have six. We have purchased all of the equipment through MedPro as the prices and service has been key to our recent expansion. It would be foolish for anyone in the industry needing equipment not to use MedPro. Thanks so much to Mike and the team. We look forward to doing much more business together in the future. R and K Management, Inc. It has been a pleasure dealing with Mike Moreno and MedPro! Thanks to you, I now feel like I am on top of the laser industry rather then the other way around. I liked the fact that you had the contacts to service and repair the IPL I purchased from you. I didn't have to spend more money on an extended service contract from the manufacturer. The training that I had went fine. My staff and I received the information we needed to feel good about using the machine right away. Thanks again for the good deal on the Palomar IPL and for not trying to over sell me on something I really didn't need. D & D Aesthetics, Inc. I would like to let you know that it was a pleasure doing business with MedPro. The whole process from purchase to delivery was smooth and done very professionally. I feel that I received two very good lasers at a fair price. My staff and I have even been able to experience the service agreement with you when we had a minor shut down with one of the lasers. You and your service advisor were able to walk my staff through the steps to remedy the situation. Another minor issue with a bladder device on the foot pedal was handled appropriately and swiftly. Again. you and your staff have proven yourselves to be as advertised and I have referred you to other colleagues of mine that should contact you in the near future. Thanks again. This is a message to thank Mike Moreno and MedPro for their professionalism and courtesy when doing business. They are always ready to attend to our necessities and the machine I got had the right price. It is doing so much for my clinic that my partners and I are planning to get more equipment sooner then we expected. Thank you. Just a letter of thanks on the purchase of our new laser. The machine is in tip-top shape and the price was right. Thank you also for setting us up with an experienced technician who taught us the ins and outs af the machine. I have purchased 10 pieces of equipment from MedPro for my two clinics. The service levels I have received have far exceeded my expectations. Mike Moreno and his team have given me excellent advice on which equipment will best meet my needs. Our team is thrilled with the quality of the equipment and the range of treatments we can perform. These are the kind of relationships that make a business successful. I have had the privilege of working with Michael Moreno and MedPro over the past 16 months. I purchased a Quantum SR/DL last August 2004, and recently a low shot count LightSheer EP. Both products were shipped quickly and in good working order. To date, both systems have performed perfectly and I have not needed to use their included warranty service. MedPro even provided one day of on-site training for my nursing staff. Michael also provided me with excellent guidance on the various laser hair removal and pulsed light systems available. His clinical knowledge and practical hands on advice has been very accurate and he has not attempted to steer me into inferior products or oversell me into products I don't need. I have since referred another M.D. friend to MedPro and he also received excellent service and customer care with the Quantum SR/DL that he purchased. During shipping of his unit, the plastic shell of the Quantum SR/DL cracked. MedPro flew a technician down in 48 hours and replaced the entire shell with a brand new shell. Even Lumenis does not provide this level of service for their own equipment. Bottom line: MedPro helped me to gain a strategic financial advantage over my local competitors. I would recommend them to anyone looking to buy used aesthetic equipment. I want to extend my gratitude for your expertise, honesty, and customer service. You guided me to find the appropriate equipment for what I wanted to do and had the whole package to go with it- the training, the marketing, and customer service- all at a price that was attainable for me. Thank you - and I would be happy to serve as a reference for you should anyone want the low down from a family practioner. In the laser aftermarket industry, it can be hard to find dealers that stand behind the products they sell. We have found Mike and the staff at MedPro to be excellent in this area. We have purchased several lasers from MedPro and they have always helped us with any problems that have arisen after the sale, and in some cases even after the warranty period. We have bought lasers from many brokers and our experience with MedProOnline has been one of the most positive. I would recommend MedProOnline for anyone looking to acquire aftermarket medical lasers. Thank you very much for your prompt response to all my inquires and needs. Everything seems to be just as you promised. I have been very pleased with all your service and would highly recommend your services to any one in the market for a laser. The Circulatory Centers purchased our most recent laser from MedPro, Inc. and we were so pleased with the price, quality and service that we received. Mike Moreno made us feel so comfortable with purchasing a refurb machine and went out of his way to accommodate our needs. I would recommend them to anyone! It has been pleasure to deal with MedPro staff, especially Mike Moreno. They have been very responsive, courteous and they do know what is best for your practice needs. 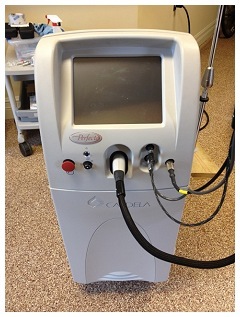 We are very happy since buying a Cutera Laser and now bought a MicroDerm machine from them also. They came through with all the promises they made including setup, training and following up after the sale. I would not hesitate in recommending anyone to MedPro for cosmetic machines. It was certainly a smooth transaction. I was very satisfied with their offer and prompt payment. I will contact MedPro for any future sale, trade-in, or purchase of used medical/aesthetic equipment. Thanks again. MedPro responded expeditiously. When there was a problem, they fixed it and were professional and courteous. They have held true to their word and have been far easier and more cost effective for me then working with the parent laser companies. Medpro was the only company to offer the right deal at the right price. More importantly, they delivered as promised and backed up the deal with the proper training and service. After being barraged by salesmen from different companies touting their equipment as the best and downgrading the competition, it was a relief to talk to Mike Moreno and MedPro. Because they don't represent any one product, they could educate me on the differences between the different systems and help me sort out which device would best suit my needs. They are interested in long term business so they are invested in helping me make the right purchase. I have also been pleasantly surprised by the service I received after the sale. I was thinking today that I was glad I bought my Lightsheer from MedPro. Why would anyone buy a new laser? It's like buying new cars instead of used. I think you will be busier as the years go by as less committed docs buy these machines that the manufacturers make out to be "easy cash cows". They will sell them to you and give up. When it gets to be time to buy my next machine, I will definitely call you. We import high value high-tech equipment from the United Sates and need to deal with a reliable, professional organization. Even a short delay in transportation can mean the loss of thousands of dollars, so we only deal with trusted names. We have found a trusted and professional organization in MedPro. Transportation times are low and the few technical issues we had were corrected in a timely manner. I would recommend MedPro to anyone wanting to import medical equipment from the United States. These people know lasers. Not just the cost, but the value to the practice and how to make them work. They respond after the sale to make sure things keep working for my practice too. I purchased three pieces of laser equipment and one microdermabrasion machine from MedPro and Mike Moreno in December 2004. MedPro and its employees have far exceeded my expectations from start to finish in this transaction. There is no question that I will use MedPro for all my future equipment purchased.